Welcome and thanks for showing up in this moment. Thanks for answering the call whether it was God softly whispering to you or a blaring blast to get you to pay attention. I know that there is no such thing as accidents, everything in our lives happens for a reason. You and I were meant to connect! So thank you again for allowing synchronicity to unfold in your life, whether it is unfold harmoniously or haphazardly. Thanks for showing up and allowing us to connect in this moment. I am Vireo, Dancing Pleasure Goddess and in this moment I would like to share some profound yet simple teachings with you that God has told me to show up and share with you. This blog is about “paying attention”. It is one of the chapters in my forth coming book, that God and I are co-authoring, entitled “101 Ways to Experience More Joy, Pleasure and Ecstasy Now”. What if there is no such thing as coincidence? What if God has orchestrated EVERYTHING in your life, right down to the tiniest of details, even something seemingly insignificant, such as a mouse scurrying across yours or my path? More on that in a moment! What if everything is happening FOR you not to you? Let me say that again, what if EVERYTHING in your life is happening FOR you, rather than TO you? Doesn’t that sound sweet? I know this to be true. Everything in your life is happening FOR you. So ask yourself, why is this happening FOR me? If for no other reason, I encourage you to consider that the Universe is orchestrating for your highest good because this is far more empowering than imagining God doing things to you and this perspective takes you out of victim mode. This allows you to be co-creating WITH God and the Universe rather than at the mercy of events and circumstances in your life. And it is also way more fun and way more joyous. I invite you to drop into a state of curiosity and the innocence of a child. May I share a recent experience with you to illustrate this point? Yes? Awesome! Last night after a very relaxing Finnish sauna by the lake, as I was cooling down in the change room, a deer mouse snuck thru the open door from outside and crept into the sauna. No, I did not scream. However, I could have ignored this moment and not made anything of it. It’s just a tiny mouse, right? In the past God had to speak to me in loud blasts or hit me over the head with the cosmic sledge hammer in order to get me to pay attention. Sound familiar? Over the last few years, through much negotiation, many late night conversations, through many tears, God and I now have an agreement. God speaks to me in soft whispers and I listen and pay attention. I no longer require my lessons to be big and painful. I am willing to learn with ease and grace. How about you? I asked myself the questions that mouse medicine invited me to look at. I journalled and sat with all of these questions and queries and with God, for a few moments. I realized that God was telling me through mouse that I was not taking care of some necessary details in my life. I needed to clean up and organize my home. I needed to complete my taxes. In less than one hour I sorted all of my income tax receipts easily. Done. I washed the dishes and tidied the cabin. Another task complete. Also mouse was reminding me that I was becoming too focused on some details in my life. I couldn’t see the forest for the trees and I was neglecting and missing out on other opportunities that were calling me. Where is there also a paradox in your life? Are there details that you are neglecting and ignoring that need your attention? Are there also bigger issues or opportunities that you are missing out on and that are calling you to wake up and take action? Mouse helps keep the details of the universe organized. Mouse is a micro manager. Remember to read the fine print especially if you are about to sign a contract. Do not be lured by the cheese and consequently get caught in the trap. Like mouse, trust your whiskers, your perceptions and intuitions. I had been in the process of a 3 year divorce at the time mouse showed up. My lawyer had just sent me a proposal. Thanks to mouse, I paid attention to the fine print and corrected a few errors and omissions. My perceptions told me that some things were missing and incorrect. Had I not done so, it would have cost me dearly. Also God was telling me through mouse to pay attention to opportunities that were calling me, to focus my energies on writing my book and consequently this blog. Mouse calls us to look at the obvious, to look at what is right in front of our eyes. Mouse calls us to pay attention. Mouse has many enemies and predators. We must take care to be on alert and remember that things and people are not always what they appear. The cheese or temptations of life can often be covering up a trap that could cost you dearly, perhaps even cost you your life. Are you currently caught in a trap? Again what if EVERYTHING in your life is there for a reason, for your evolution, FOR you? Mouse medicine encourages us to develop a “largesse of spirit” and to “become aware of the Great Dance of Life”. (Sams, Jamie and Carson, David. Medicine Cards (Santa Fe: Bear and Company, 1988). Realize that although you may be sitting in the middle of nowhere, remotely isolated in a cabin by a beautiful lake or sitting alone in your apartment in a large but unknown city, or in your big mansion in a booming metropolis – out there somewhere– there is a vast infinite universe, a solar system, a moon, a sun, an immense space that is calling you to take a leap of faith, to think BIG and to get outside of the box you have enclosed yourself in. Get out of the mouse trap or exit the rat race and open to something bigger that is calling you. The message is right here before your eyes! What needs to be organized or cleaned up in your life? What do you need to scrutinize in your life, to give more attention to? In the past, I have often tried to do too many things at once and as a result I have scattered my energies and wasted time and accomplished little. Mouse encourages us to handle one thing or task at a time; to focus and complete one cycle. Thank you for joining me. May you take a moment to pause and look at your life and notice what is calling you to pay attention and then take immediate action accordingly. If you are feeling disconnected, stuck or not sure what to pay attention to, perhaps you are feeling overwhelmed and scattered, go to my website “Dancing Pleasure Goddess” and fill out the questionnaire to qualify for a free one on one intuitive session and allow me to support you. 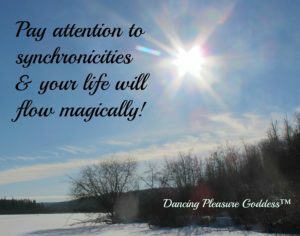 I can help you to go from disconnected, stuck, scattered or overwhelmed to feeling more juicy and in the flow of life, to dance thru life. Fill out my questionnaire now. Namaste. Thanks again for joining me. You may as well be yourself, everyone else is taken! I trust that this blog served you and supported YOU in being YOU! Go take your action now! Thank you!